Risotto is one of the easiest meals to make and a great way to use up leftovers as well. Try this lean version that uses turkey and is packed full of flavour, with a little bit of a soup consistency. Perfect for this time of year. It is now that time of the year that summer salads start becoming a distant memory, we pull our big jumpers out from the storage under the bed, we keep our feet warm with fluffy socks and we rescue our casserole dishes from the back of the cupboard. For some people that would make them a little sad, but not me – I love autumn! I love all the seasonal produce and the thought of finishing work and being greeted by a hearty and warming casserole or soup puts a smile on my face. 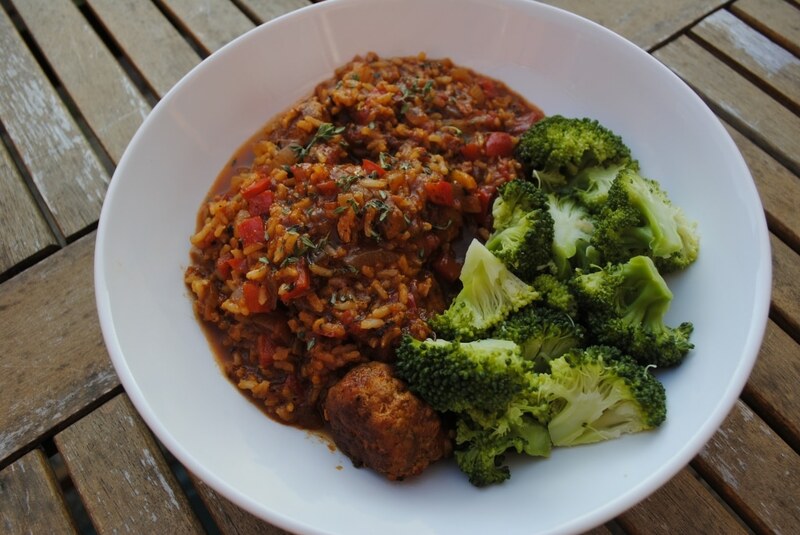 Risotto is a great way to use up vegetables from your fridge and use whatever meat is on offer to make it budget friendly. I made this with minced turkey breast as it is lean and the flavour is not too overpowering, but you could use beef, pork, lamb or chicken. Sometimes I like to chop up sausages and add those instead. Instead of peppers and onions I have used leeks, carrots and parsnips. This dish really is adaptable. You can make it vegetarian by adding beans instead of meat. Risotto shouldn’t be dry, but that is where a lot of people go wrong. I have taken this risotto one step further and added extra liquid to it so it is more of a soup. You could add less stock if you wanted to, or if you wanted to make it more of a soup, use extra liquid. But this was the perfect balance for me. 1) Divide the turkey mince in to 15 pieces and then roll them in to balls. 2) Add some olive oil to a large pan and once hot, add the turkey meatballs and cook for 3-4 minutes, turning frequently so they don’t burn. Remove them from the pan and put to one side. 3) Dice the red pepper and onion and add to the pan with a little more oil and cook for 3 minutes. 4) Add the rice, tin of tomatoes and dice the 4 tomatoes and add them too. Pour in 3/4 of the boiling water, the paprika, chopped parsley and salt and pepper and stir well. Cover and simmer for 12 minutes. 5) Take the lid off and add the remaining boiling water and the turkey meatballs and cook for 5 more minutes. You may need to add a little more water if it becomes too dry. 6) Divide between bowls, sprinkle with parmesan cheese and serve with broccoli. 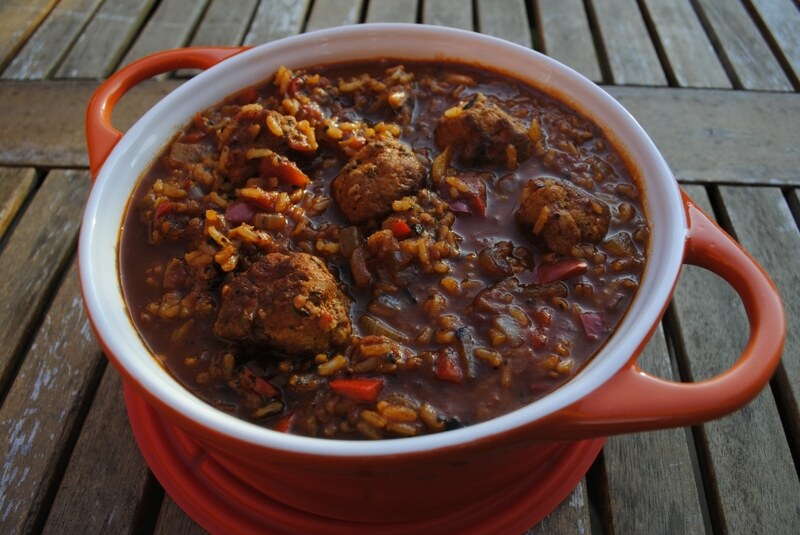 What is your favourite warming winter meal? Leave a comment below. I love how hearty this recipe is – meatballs and risotto?? So delicious! your food photography is absolutely amazing! I just stumbled upon your blog, and am so glad I did! Really looking forward to reading more of your posts! 🙂 Thanks so much for sharing this recipe! Thank you 🙂 Welcome to my blog! This risotto soup looks amazing! Love all the flavours!